There are four really exciting things that have happened here at startcooking.com which I am thrilled to be sharing with all of you! I am now one of Federated Media’s new authors. Federated Media is going to be helping us support startcooking.com by connecting us with advertisers. I am so proud to be part of the Federated Media family. And don’t worry about entering your email! The only reason we’re asking for it is so we can contact the winner. We promise we won’t use it for anything else. We also have an amazing new index! The alphabetical listing as well as the category listings has been a huge hit so far. We will be adding a new category to Kitchen Basics called “Reference Charts” which will surely be a big help to everyone. Adding the video to the blog page has helped to integrate the videos and the blog. There are many people who only ever saw the videos and were totally unaware of all the photo-tutorials on the blog side of the site! I hope you are all enjoying startcooking’s new look! This is by far the most unexpected event of all! Startcooking.com videos had already been on a number of video sharing sites (including Veoh, i-tunes, i-Food.tv, metacafe, graspr, mywaves.com and howstuffworks.com). 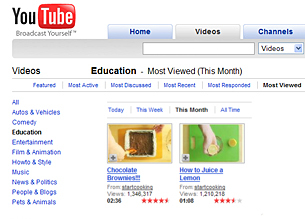 However, in the past two weeks, Chocolate Fudge Brownies and How to Juice a Lemon shot up to become the number one and two most view videos in the Education category on YouTube this month. They will most likely end up being ranked in the top five of All Time views in Education, ever! As a result of this, there has been a gigantic spike in the viewings of all my videos. It is quite clear startcooking is filling a need. I would like to thank everyone for the tremendous support shown to startcooking.com. For me, it’s all a dream come true. What a lot of exciting news! Real Simple is a great magazine and you are in really great company! Glad to see you are really taking off with such a great idea! Thanks Deborah, I can honestly say I’m living the dream and what a thrill it is! Hi Kathy. Congrats for your videos blog. It’s awsome!